If you can keep your head when all about you Are losing theirs and blaming it on you, If you can trust yourself when all men doubt you, But make allowance for their doubting too;! We had a kettle; we let it leak: Our not repairing made it worse. We haven't had any tea for a week... The bottom is out of the Universe. Kipling so loved his masonic experience that he memorialised its ideals in his famous poem "The Mother Lodge". He is regarded as a major "innovator in the art of the short story"; his children's books are enduring classics of children's literature; and his best works are said to exhibit "a versatile and luminous narrative gift". George Orwell called him a "prophet of British imperialism". : /ˈrʌdjəd ˈkɪplɪŋ/ RUD-yəd KIP-ling; 30 December 1865 – 18 January 1936) was an English short-story writer poet and novelist chiefly remembered for his tales and poems of British soldiers in India and his tales for children. 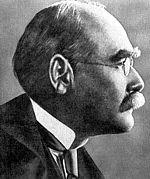 Kipling was one of the most popular writers in England in both prose and verse in the late 19th and early 20th centuries.